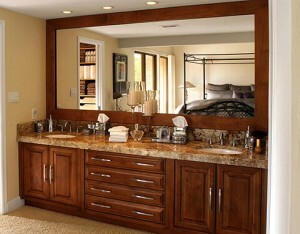 We have custom cabinets and vanities for your bathroom to fit all budgets. Our vanities are 100% premium plywood and made to last. Whether you are looking for standard-sized vanity cabinets or professionally designed cabinet layouts, we are more than happy to accommodate your requirements. If you are thinking of replacing your bathroom vanities or purchasing new cabinets, stop by our Tampa showroom. Most of the time we can meet or beat competitor pricing for new cabinets of equal or better quality. You can make an appointment to meet with our knowledgeable staff or stop by anytime during our business hours to see our selection. Click here to view some of the bathroom vanity cabinets we have to choose from!